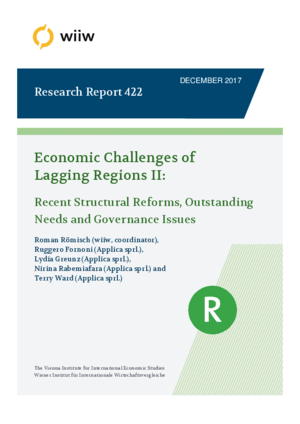 This report is concerned with analysing, for eight EU Member States with lagging regions, the main structural reforms carried out over the past five to ten years, essentially those which are relevant for the European Structural and Investment Funds. Furthermore it provides an overview of the remaining structural reforms needed, including to the system and operation of governance, and their relevance for lagging regions. The identification of the remaining reforms needed is based on a detailed analysis of the main indicators that can be identified to assess the situation in each of the eight countries concerned and, so far as possible, in the lagging regions in them. An additional concern is to gauge the effects of the reforms carried out with a particular focus on the lagging regions. The first subsection of the report briefly sets out the structural reforms covered by the analysis and the rationale for choosing these from among all those subject to the European Council’s Country-Specific Recommendations. It then presents for each of the eight countries and the lagging regions the main structural imbalances in the form of a concise summary bringing out the main points emerging from the detailed analysis for each country. The second sub-section assesses the effects of labour market reforms on investment, productivity and competitiveness. A third sub-section examines the business environment in each of the countries and the lagging regions within these as well as the structure of enterprises and business demography, and attempts to relate this to the business environment. It also considers the reforms which have been carried out over recent years which have been aimed at improving the situation in which businesses operate.